Running with Ken Bob Saxton was an eye-opener. I’d been thinking I had this stuff all figured out, but with his 1000s of miles of barefoot experience and ever thoughtful approach, BKB gave me a new perspective. As a consequence, after a couple early evening hours up in Gloucester last week, I am trying a complete reset on my running technique. Ken has run 76 marathons, 75 of them barefoot. 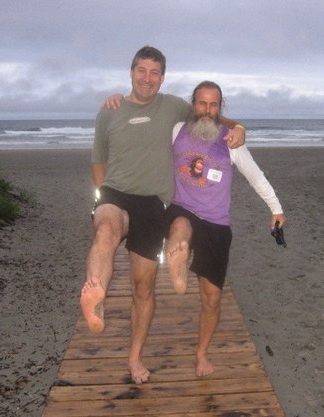 His first barefoot marathon was in 1997, when he started his website, still the premier on-line resource for barefoot runners. In 2004, he ran one in each month plus an extra in April–his first Boston. Currently, he is about halfway thru the Summer 2010 Tour during which he running clinics in thirty locales from California to Camden, ME. BKB doesn’t think of himself a hippie, though he gives the impression. He just lost his VW Bug for a Jetta, but features a flowing gray beard and pony tail. The clinic began with Ken Bob’s (slightly longwinded) stream of consciousness, roughly following his running history, but meandering through thoughts on philosophy and running technique. It got real when he lead our little band of ten (he’d drawn 40-50 in Cambridge the night before) off to the roughest terrain he could spot. This was a half acre field of heavy, nasty, chunky gravel with a few puddles in the middle. After we all dragged ourselves across, putting on a good face, someone asked, “So can you really run on this stuff without it hurting.” His answer was to shoot off across that rocky minefield like a gazelle. This was the seminal moment for me; it was incredible to see how smoothly and quickly he floated over that horrible surface. For Ken, it’s all about a light landing. He sports a bent knee style that I had more or less rejected, but am now emulating. He likens the proper stride to Groucho Marx’s signature gate. Despite his pretty much never wearing shoes, BKB’s soles don’t seem any tougher than mine. His experience is that you can run on almost anything painlessly if you are landing right. The rougher the surface, the benter the knees. And how do you know if you are landing right? Your feet will tell you. Ken (who once worked as a quality engineer) calls soles the QA inspectors of the running process. They’ll tell you if there’s process problem, so you know to go back upstream and correct something. Further, he looks at a nasty surface, like the one we ran on, as the best training ground for your stride. Running on grass, you get no feedback. Running on rocks you know immediately if you are landing heavily. In the past, I have poo-pooed is the notion of a minimum 180 pm running cadence, but I’ve come around on that issue. BKB can move his feet crazy fast; he motors. He’s convinced it’s much more efficient. What I’m convinced of is that with a shorter stride, it’s a lot easier to land lightly. I did a few laps over the bad gravel, Groucho bent with high frequency short steps, and managed OK. So, I’m overhauling my stride. It feels like work to keep the cadence up, but I believe I will adjust. And, curiously, I’ve got some minor soreness in my hams and quads as a result. It’s good soreness, the kind that feels like progress. I had nearly written off the possibility of barefoot trail running, thinking that’s what VFFs are for, but now I’m going for it. Ken’s running philosophy is to relax and keep it fun. Implicit is the need for patience. That’s great advice for new or converting barefoot runners. This entry was posted on June 14, 2010 at 6:33 am and is filed under Barefoot Running, Experience, Other Runners. You can subscribe via RSS 2.0 feed to this post's comments. You can comment below, or link to this permanent URL from your own site. Where do you think your speed is at spending the last year barefoot compared to being injury free with shoes. Are you slower/faster? Do you ultimately think you will be as fast or even faster if you master your barefoot stride? Do you care? Last question first…I don’t really care, so I don’t track it. At least at this point. My guess is that I am slightly slower now for my normal 3-4 miles, but will get back to about where I was. It will be interesting to see what happens as I try the high cadence approach; could get faster. And, it’s not been a year, only since early January. I REALLY need to get better at running on gravel. I hit a short stretch today and wanted to off myself. Then, 10 seconds after we were off it I was fine. I am going to practice running in place on stones to find what is lightest and easiest. While hopping really far with a long stride seems to be the least painful way(since you are spending less time on the gravel) it seems ken bob almost distributes his weight over both feet, thus reducing the pain by 50%. I was fishing the last few days with a bunch of buddies in northern NH. We were swimming from a very gravely beach and they wanted a barefoot running demo, so I went BKB style and impressed the gang. Ken Bob definitely drops the hips, therefore bending the knees as the surface gets tougher, and maintains high cadence/short strides. Seems to work.